One of the biggest issues that my students and new clayers face is learning to play with color and not to be afraid to do it. 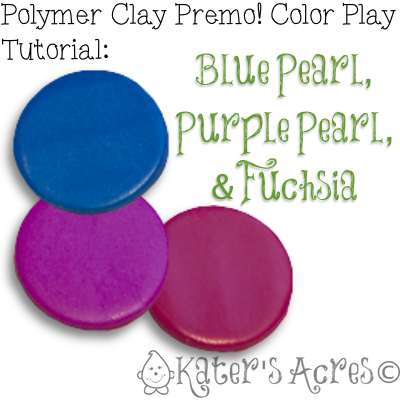 Today I’m going to walk you through a very simple process of how you can learn to play with triadic colors on the color wheel and make your own simply by learning how to play with polymer clay colors straight from the package. For a more in-depth discussion on basic color theory, Parker’s Basic Color Theory eBook might be just what you need. It is important to choose colors that are next to each other on the color wheel, or at least near each other. If you choose colors that are on the opposite side of the color wheel, you will end up with mud. No one likes mud. Begin simply by mixing just 2 colors in your palette together. I begin by using equal portions of each color. This will immediately show you which color is more saturated. Whichever color is stronger in your sample is the more saturated color. You may recognize this color because it’s a color I use often in my studio as it’s one of my favorites. It’s a color recipe I shared a long time ago for Deep Ocean Blue. If you are using triadic colors, you will not ruin your new color by adding a third color. In order to do this you will add 1 part of your new color (in this case Fuchsia) to the mix you just created. You will now have 1 part of all three colors in your new sample (shown with the star). This is likely the hardest part for most people. You took 3 colors and made 5 colors … now it’s time to ask yourself some questions. What do you think about the two colors you just made? What are you going to DO with these colors? Maybe you will decide that you want to add another color into the mix. Or maybe you will strengthen the colors by adding more. Example: I took my new color from step 3 and added one more part fuchsia to the mix. Therefore the new color (shown with a star) is 1 part blue pearl, 1 part purple pearl, & 2 parts fuchsia. Because you are trying to learn how to play with polymer clay colors, try making tints (adding white), tones (adding grey), or shades (adding black). Doing this will also give you an idea of what will happen to the color when you try changing the spectrum of light hue. Example Shows: Color 5 (shown in step 3 with a “star”) made into tints, tones, and shades. For a more in-depth discussion on basic color theory using Parker’s Color Wheel, see Parker’s Basic Color Theory eBook.